Debra sent her Lone Star to me for quilting. I must say she has done a beautiful job piecing it. I especially like her choices of fabrics. They all work together to make the star radiant. 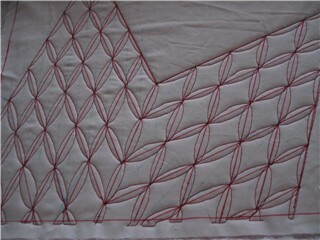 We had decided on the inside of the star to do Continuous Curves which I have done on my DSM but have never done on my longarm so I loaded a practice piece to warm up on. I sketched the star’s diamond shapes on white fabric with a red marker. 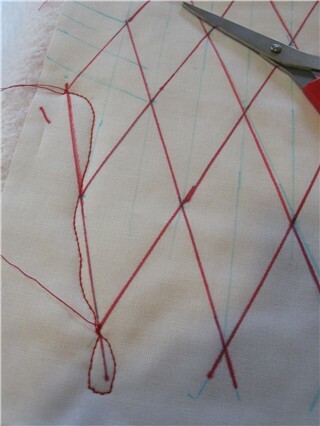 The thread I used is also red. My first attempts were, shall we say, less than stellar. 🙂 Don’t worry, Debra, it does get better! There, that is more like it. It took a while to get the hang of keeping the curves consistant and hitting the intersections every time, but I think I am getting the hang of it. Now to figure out what to do in the backgrounds. Isn’t that an interesting red on white pattern just the way you have it? Reminds me of a whole cloth with some oomph! We can all scout around and look for square and triangle ideas for you. Do you have some pantographs? Well, this begins to answer the question I posed in my comment to the Lone Star Quilt in Debra’s blog. 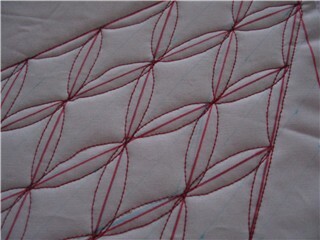 I thing that curved quilting in those diamonds is going to look wonderful. I’m so proud of you gals for what you are doing.